Back in the summer of 2008, my husband and I travel to St. Louis for the wedding of two of our very good friends. While there we dined at Niche, a lovely spot in the historic Benton Park neighborhood. It’s also the home of chef Gerard Craft, one of Food and Wine’s best new chefs from that same year. The entire meal was wonderful, but in all honesty the only thing I specifically remember eating was the braised pork pappardelle, which is a staple on the menu. Melt in your mouth pork tossed with lighter than air pasta, all coated in a rich, smoky and sweet sauce. It’s the ultimate comfort food. I loved it so much that I actually traveled to St. Louis a few years later just so I could dine at Niche a second time. The things we’ll do for food. So you can only imagine my surprise when, on a random whim, I Googled the recipe and actually found it. Straight from Gerard Craft himself. And while I could never do this recipe the justice that he does, it’s a great substitute when driving five hours to St. Louis just won’t do. It’s so wonderful. Preheat the oven to 300 degrees. Season the pork with 1 1/2 tablespoons of sea salt. In a medium oven-safe dutch oven, heat the canola oil until shimmering. Add the pork and cook over moderately high heat, turning, until browned on all sides, 15 minutes. Transfer the pork to a plate. Add the apple, onion, carrot, celery, garlic and thyme to the casserole and cook over moderate heat until beginning to brown, about 6 minutes. Add the tomato paste and cook, stirring, until it deepens in color, about 2 minutes. Add the wine and bring to a boil. Add the chicken stock, vinegar and honey and bring to a simmer. Add the pork, cover and transfer the casserole to the oven. Braise the pork for about 3 hours, turning once halfway through, until very tender. Transfer the pork to a plate. Strain the sauce into a large bowl, gently pressing on the solids. Pour the sauce back into the pot. Using 2 forks, shred the pork; discard any large pieces of fat. Transfer the shredded pork to the sauce and stir in the mascarpone. Season the sauce with salt and pepper. Cover and keep warm. Meanwhile, in a large pot of boiling salted water, cook the pappardelle until al dente. Drain the pasta and transfer to the casserole with the sauce. Toss the pasta with the sauce and the parsley over moderate heat until well coated, about 1 minute. Transfer the pasta to warm bowls. Don’t you love it when Google presents you with just what you’re looking for? I’m bookmarking this and making it soon. It sounds divine. Braised dishes are just packed with flavor. Thanks for sending along the recipe. Words cannot describe how good this is. So amazing! I want this in my belly immediately. Oh yum! Looks fab!! I could totally go for a warm bowl of that right now…. paparadelle is one of my most treasured pastas – i love the thick long noodles. They make my tummy sing 🙂 And who doesn’t love pork?? I’ll take 2 please! It looks hearty and delicious. 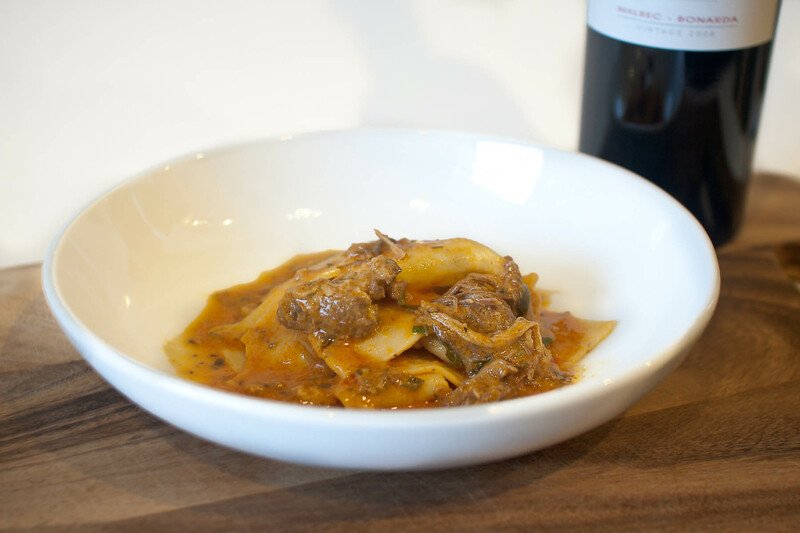 braised pork and pappardelle, what a wonderful combination! Thank you for sharing. I’m looking forward to trying this one after Thanksgiving, when we are ready for a new flavor, something besides Turkey and stuffing. yum!